Imagine that your uncle is Robert Rauschenberg and that he leaves you his printing studio when he passes away. You and your favorite art buddies adopt it as your second home, exploring all his legendary printing methods and making art experiments for hours at a stretch. 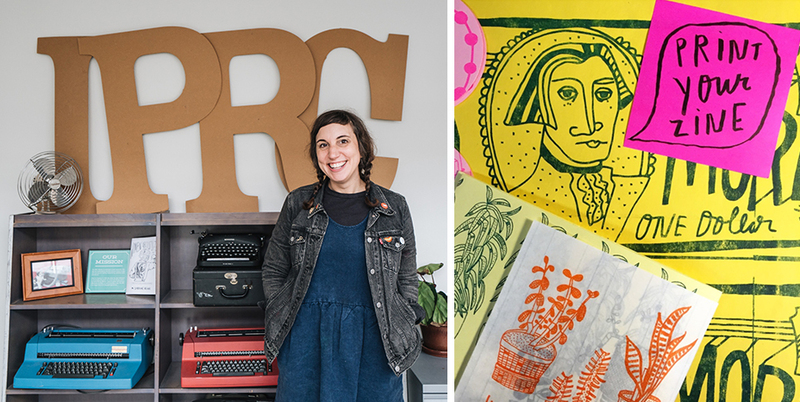 That’s what IPRC feels like—a dreamy art garage with a wide array of printing equipment. Generations of Portlanders have used IPRC to screen-print show posters, letterpress cards, bind chapbooks of their poetry, meet with their writing groups, and print their comic books. You can see the evidence of their devotion—the tabletops are covered in marks from years of elbow-leaning conversations and X-Acto knife precision cuts. 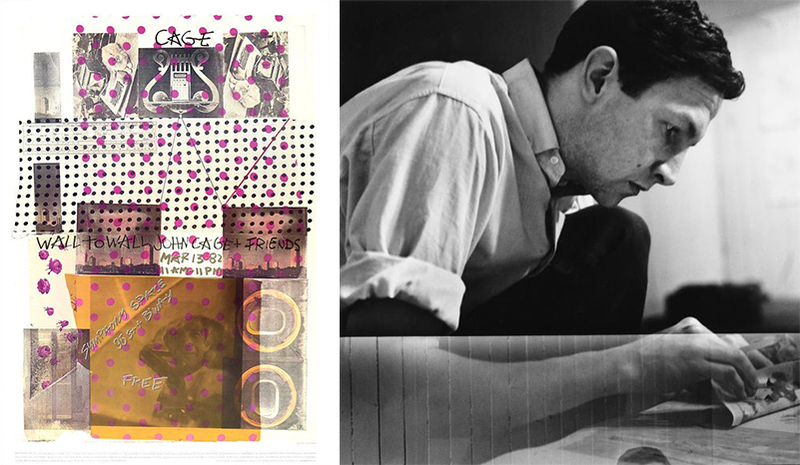 Robert Rauschenberg poster “Wall to wall 1982”, Rauschenberg working on a solvent transfer drawing in his Front Street studio, New York, 1958. Photo, Jasper Johns. Courtesy, the Rauschenberg Foundation. And those tools live in a huge new space—2,000 square feet, housing a wall of 20” iMacs, a screen-printing studio, a letterpress studio, a zine library, a bindery, and meeting spaces. Membership fees are radically low, and those who can’t afford the fees can volunteer to gain access. Inks are on the house—all members have to bring is paper. IPRC Program Director Haji Quinn with Kate Bingaman-Burt in the zine library. Gecco printing at the IPRC re-opening. Photos Darius Kuzmickas. 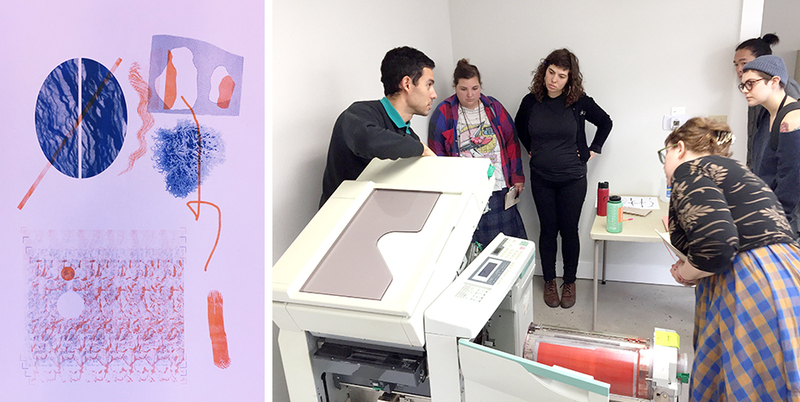 The big news at IPRC is the brand-new Risography studio with classes launching this coming spring. They recently purchased three GR3750 machines with a generous supply of ink cartridges and launched a Kickstarter campaign to fund Risography clinics for members, among other studio projects. Risography machines, manufactured in Japan in the mid-1980s, allow users to scan art into a copier that prints transparent layers of ink one color at a time, resulting in a deliciously organic layering of ink on paper. The machines are made for high-speed replication and will spit out art posters at a brisk clip. This hybrid of screen-printing aesthetic and high-speed replication has gained Risography a cult following over the past few years, and the machines that have not been snapped up are selling for top dollar. Risography prints created by Katherine Spinella, and by RetroJam Osaka. John Akira Harrold runs a Risography workshop for volunteers. Photos Marilee Sweeney. 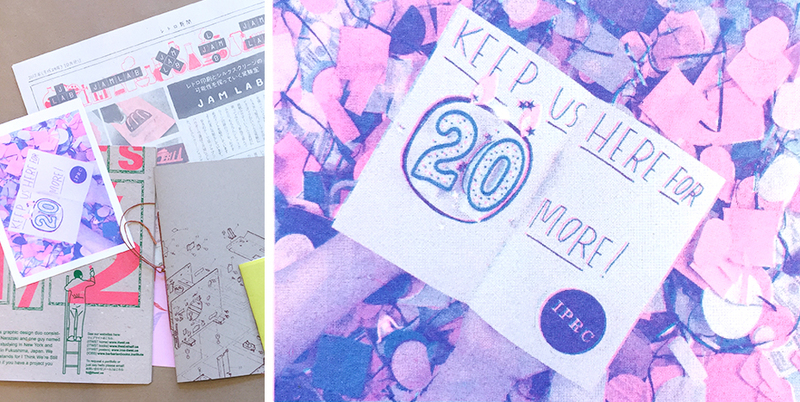 Kate Bingaman-Burt, illustrator, head of the PSU graphics department, and IPRC board member, has big dreams for IPRC’s future. “I feel like with this new space there’s so much potential….We’re poised for so much growth as far as programming that can be offered. I first heard of IPRC when I was actually teaching at Mississippi State University….I was doing a zine project with my graphic design students and I found this place on the internet, located in Portland, Oregon and it sounded like this magical space, where anyone who’s interested in learning how to publish their drawings, publish their comics, publish their writing….could go and find community, and support and resources in order to help them make the work that they wanted to see in the world, basically. Kate Bingaman-Burt in the IPRC offices, and illustration work. Photo Darius Kuzmickas. When you walk back into the core of the IPRC studios, those twenty years of collecting are impressive—you find yourself surrounded by tall cases of lead type, and an entire flock of letterpress machines. The iron cast presses have the gravitas of commemorative sculpture—which makes using them for personal print projects feel irreverent and euphoric. The experimental influences of the Black Mountain College and bold type-driven styles artists like Corita Kent are obvious in the prints filling the letterpress drying racks. Black Mountain College may have closed its doors, but IPRC makes sure its members can pick up the spontaneous and radical art fun right where they left off. 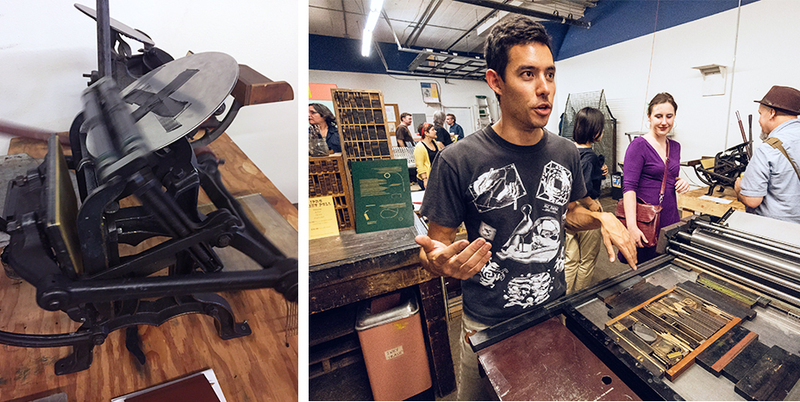 John Akira Harrold explains the letterpress process at IPRC’s grand re-opening. 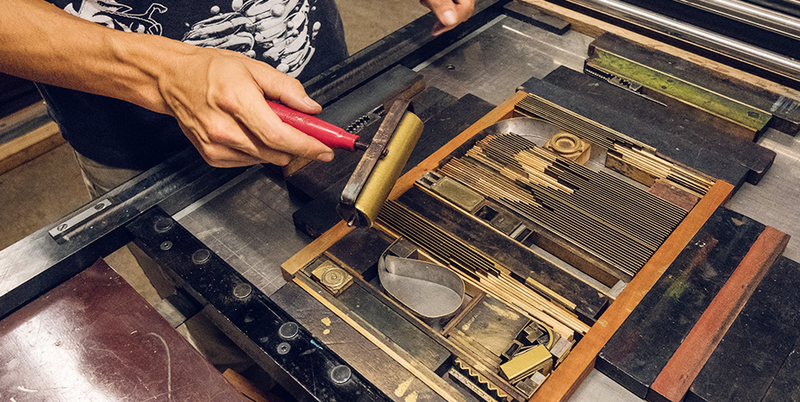 The C &P letterpress getting inked up. Photos Darius Kuzmickas and Marilee Sweeney. You don’t have to be a member to hang out and work at IPRC. Anyone can design in the digital lab for $5 an hour, and use their iMacs, laser printers, and scanners at printing prices lower than Staples or Kinkos. IRPC recommends you fill out a membership application online here, then come by the center to pick up new member materials. Intro workshops are required to gain access to the print studios- the workshop fee gets you two months of free membership. IPRC is always looking for volunteers. Volunteers receive free monthly membership and can take a free class after three months. Donate to and share their Kickstarter Campaign. 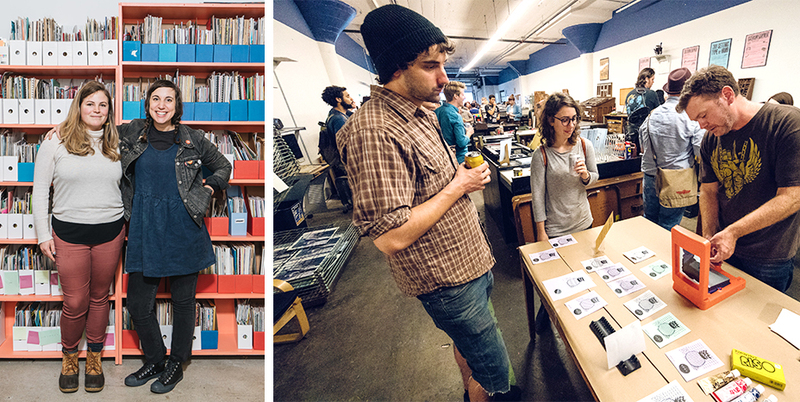 Keep the independent design accessible and vibrant in Portland. 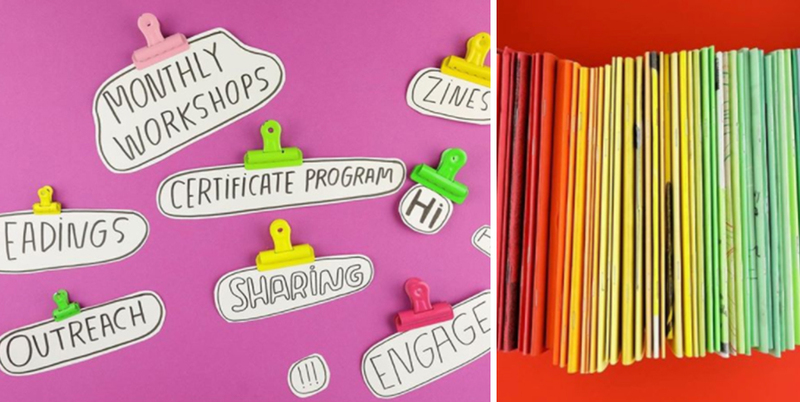 Volunteer in the studios, and step up your printing knowledge this spring! Re-opening with a new washout booth in January 2018. IPRC story banner background art by Katherine Spinella, layout design by Marilee Sweeney.